Writeups.org (“Worg”) is a community project, not a commercial venture. As such it depends on people rolling up their sleeves and pitching in because they like it. No contributions means no community and no site. It is important to understand that writeups.org is created by a stupidly low number of volunteers, as a hobby. This crew is scattered from France to the Philippines, from Canada to Brazil. Pen-and-paper RPGs are a semi-obscure hobby, this specific game has been out of print for many years, most people have moved on to other RPGs or other hobbies. Furthermore, we all have to deal with careers, children, loved ones, life accidents, medical issues, religious duties, military obligations, professional projects going into perpetual crunch, other hobbies, creative burnout and writer’s block, hard drive crashes, etc. etc. This greatly reduces the number of available work hours. So yeah, there’s a “Help Needed” sign on our door. If you click on an Amazon advert on writeups.org, almost anything you buy next generates a percentage for writeups.org, at no cost to yourself. Think about that when you do your next big bit of online shopping (Black Friday, Christmas, Cyber Monday, etc.). Zero effort on your part and you make the megacorporation pay writeups.org’s bills. The mighty mighty donation page supports Paypal and Patreon, and one-off as well as monthly donations. These are standard, reputable online payment tools with all the usual amenities, so it’s all done in a few clicks. The donations are the only budget we have to fill the war chest to pay for improvements. It usually takes multiple years of donations to pay for a short (a few days) engagement with a web developer. The community that does Worg lives on a Yahoo! group . Though you need to “apply” (it’s solely to avoid spammers), you can then choose how much e-mail (if any) you receive, and the *vast* majority of folks just lurk anyway. Each online community is different (we go for “polite” and “grown-up”). So a bit of observation via lurking is always necessary anyway, IME. See if you can fit in or if it’s not your speed. So you should read the FAQ article about the community, if you’re interested. Or even if you don’t think you are, you never know eh ? That means using the sharing buttons, retweeting , liking , reblogging , pinning , hearting , etc. Worg looks markedly less amateur hour nowadays. Furthermore, Marvel Studio and Netflix have given super-heroes an improved patina of respectability (or at least financial success). So sharing its content ain’t going to make you look bad. And whatever you think about social media, it is essential for a site’s success – particularly Facebook. Increasingly, sites that don’t get mentioned on Facebook might as well not exist. If you don’t like how the site looks with the ads (which is unlikely, given how our adsload is done) you can always turn it back on, right ? Right. That’s important. Now, doing so has downsides. Namely, it may be that nobody can meaningfully answer your question/comment, because it’s a small, very busy crew. So any comment or question could bomb and get no reaction. Or only get an answer one month later (that happens a lot). Sorry about that. But comments and questions remain essential, both to improve quality and for the morale of the writers. For instance, our successful glossary article comes from community members speaking up as they didn’t know obscure pieces of jargon that others took for granted. 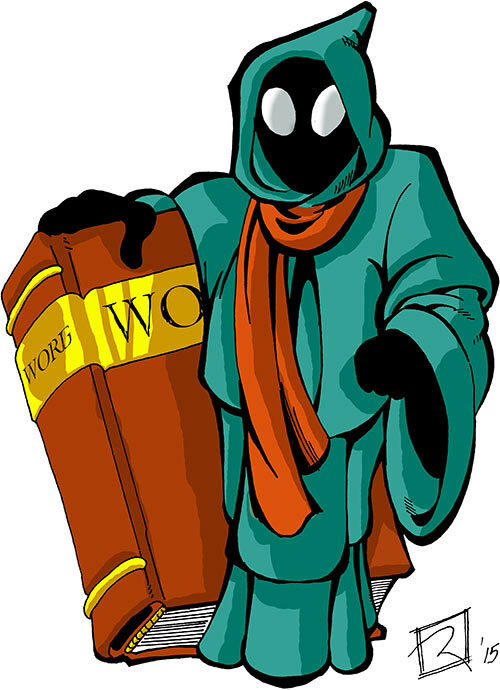 And many of the more interesting bits on Worg come from people asking “why did you do things this way ?”, pointing out that we missed something during research, observing that a given bit is confusing to them and should be better explained, expounding about an alternative view of a character or rule that should be represented in a profile, etc. Even politely pointing out typos is welcome. Typos are bad and make us feel bad. “WORG Patrol” is a tag used in messages when somebody notices a problem with an entry that has already been published. Ideally there could also be suggested updates for Amazon recommendations. For instance because there’s finally a trade paperback for previously uncollected comic book issues, or because there’s a good action figure of the character and we missed that. “Homemade characters” are made-up, original creations with DC Heroes RPG stats. They have their own category on writeups.org (about 380 entries as of this writing). “Sample characters” are fleshed-out Player Characters in video game. They serve as a window into the setting, the plot, the possible Player Character powers and skills… Examples include Mandala Shepard (Mass Effect), Jolene Hassan (Fallout) or Alamen Tabris (Dragon Age: Origins). Since it’s largely stuff you made up — fan fiction of a sort — there can be little research involved, and less possibility of being factually wrong. So it’s a low-involvement way of doing a character writeup. Essentially you’re requesting that writeups.org host your prose (and stats). Just talk to us beforehand, even if it’s just for logistical matters (such as using the thrice-blessed template). When doing profiles, we often enjoy discussing related materials. For instance bits of historical context to facilitate understanding and add verisimilitude, likely sources of inspiration in then-contemporary movies, discussion of how an important aspect of the character (such as peerage) actually works, etc.. It adds heft to a profile, adds narrative hooks, makes it easier to use in a new story. This is often a result of teamwork, so even people who don’t know much about a given characters may have relevant knowledge (or the willingness to acquire it) to reinforce the profile. Digital reissues and digital releases are now our standard for comics. They provide a *much* crisper, higher-quality image than even a good scan of a recent high-quality paper printing. However, redoing most of the art on Worg to this standard (well more than 30,000 pictures) is impossible with the existing resources. So we’re quite interested in people who know a thing or two about Photoshop and are willing to re-do some of our older images to our new standards. We’ll just need to discuss processes and formats first. Very similar considerations apply about redoing screen captures of movies and TV series from genuinely HD footage (Blu-Ray, mostly), and screenshots for our oldest video game articles. Early on (we talking turn of the century) it was still accepted practice to copy content from other sites and fully credit it. It was in no small part because these sites were expected to disappear (most were “homepages” at some university, to be abandoned upon graduation). Most of the content we thus copied *has* vanished. However, the Internet has changed, which means in turns we have a set of very old profiles that are missing their History section. Because we have long since removed copied material from those sites who did survive the 1990s and early 2000s – a backup isn’t needed. Writing such sections is much less demanding that writing a full profile. In fact, reading various secondary sources and doing an original summary could be sufficient in most cases. But we don’t have enough time to do that, especially for our older entries about brawling video game characters. Writeups.org itself is run with spit and bailing wire. Free consultations from professionals are behind almost everything that is good with it, and we sure could use more. Yes, again, but this one is more about active promotion and evangelisation. Most of our social networks presence is at best amateur hour, the rest is perfunctory. Having somebody who actually understands how to work this field advising and pitching in from time to time would help quite a lot. Or even just somebody agreeing to run our Tumblr page, setting up an Instagram page, regularly mentioning our work on a busy forum where they post a lot, etc. This tends to be major work – a full-time hobby that takes a long time to master. Many writeups are a huge amount of work, though of course it is possible to control the damage by picking characters with a reasonable amount of material (say, movie characters or video game monsters) and straightforward abilities that resemble those of well-documented characters. A writeup has a lot of moving parts and we try our best to help new contributors, including parts one might be self-conscious about (for instance, if English is your second or third language). ”Try” because as mentioned, we tend to be real busy. Just talk to us before starting working so we can chat about logistics, likely workload, similar characters that are already written up and can serve as benchmarks, writing style, statting conventions, image formats, booby traps, etc. etc. etc. Of particular interest are those works where we didn’t do a full sweep. For instance a video game where only some of the companions are written up, a Limited Series or a short comic book run where we only wrote a few characters, a movie where only the lead character got written up, etc. The point is that a lot of the heavy lifting and benchmarking has been done, and you have highly germane profiles to guide yours. So it’s a good opportunity to contribute without committing to getting more work down than you can chew. Traditionally we have been DC Heroes-centric, with DC Adventures/Mutants & Masterminds 3rd being added once it became clear there’d never be a new DCH edition. Adding stats for a third system is entirely feasible and relevant. However, it should be clear that it’s going to be a lot of work, and lot of complicated logistics and format issues, and peer review stuff… So, high commitment. We do have standards of quality to maintain.